Edgewood Health Network is a group of alcohol and drug treatment facilities located in Canada. Marketing Mojo began working with Edgewood to help improve their visibility to prospective patients online and increase qualified inquiries, helping those that needed help to connect with treatment faster at Edgewood. This paid search and SEO case study outlines Marketing Mojo’s efforts to increase inquiries. Marketing Mojo employed both paid search advertising and search engine optimization (SEO) for Edgewood to increase visibility and connect those in need of addiction treatment with the Edgewood facilities. Implementing click-to-call coding on the landing page phone number which allowed for additional call conversion tracking. Marketing Mojo helped fix problems with Edgewood’s new website, including the country settings, which were incorrect in Google Search Console. Fixing this issue helped the site move back to Google.ca results and show less in Google.com results. In addition, Marketing Mojo identified issues with Google Analytics setup for the site and made the necessary changes to track and measure accurately. 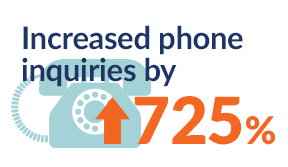 From paid search alone, Marketing Mojo increased incoming phone inquiries by over 725% and increased online inquiries through landing pages and the website by over 450%. 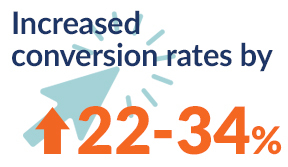 On top of that, conversion rate increased overall by 34% while cost per conversion decreased by 44% year-over-year. In the first four months alone of managing the SEO, Marketing Mojo increased Edgewood’s Google organic traffic by over 10% and new visitors by over 9%. In that same time period, the A|B test yielded 50% more click-to-call inquiries and improved the conversion rate by 22% using the larger phone number.